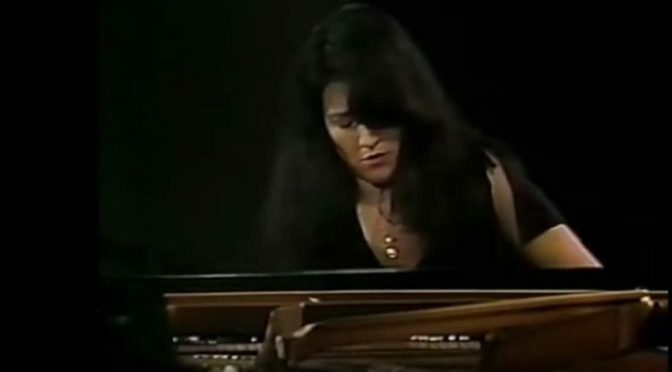 Accompanied by the Berlin Radio Symphony Orchestra, Argentine classical pianist Martha Argerich performs Sergei Rachmaninoff’s Piano Concerto No. 3, Op. 30. Conductor: Riccardo Chailly. Recorded on December 5th, 1982. Allegro ma non tanto (D minor)The first movement revolves around a diatonic melody that soon develops into complex pianistic figuration. The second theme opens with quiet exchanges between the orchestra and the piano before fully diving into a slower theme in a major key. The first part of the first theme is restated before the movement is pulled into a loud development section which opens with toccata like quavers in the piano and reaches a loud chordal section. The whole development exhibits features similar to a canon, such as an eighth note passage in the piano in which the left hand and the right hand play overlapping figures. The movement reaches a number of ferocious climaxes, especially in the cadenza. Rachmaninoff wrote two versions of this cadenza: the chordal original, which is commonly notated as the ossia, and a second one with a lighter, toccata-like style. Both cadenzas lead into a quiet solo section where the flute, clarinet and horn restate the first theme of the exposition, accompanied by delicate arpeggios in the piano. The cadenza then ends quietly, but the piano alone continues to play a quiet development of the exposition’s second theme before leading to the recapitulation, where the first theme is restated by the piano, with the orchestra accompanying, soon closing with a quiet, rippling coda reminiscent of the second theme. Intermezzo: Adagio (F sharp minor/D flat major)The second movement is opened by the orchestra and it consists of a number of variations around a single lush, heavily romantic melody following one another without a rigid scheme. The melody soon moves to the tonic major which is the second theme. After the first theme development and recapitulation of the second theme, the main melody from the first movement reappears, before the movement is closed by the orchestra in a manner similar to the introduction. Then the piano gets the last word with a short “cadenza-esque” passage which moves into the last movement without pause. Many melodic thoughts of this movement allude to Rachmaninoff’s second piano concerto, third movement, noticeably the Russian-like, E-flat major melody. Finale: Alla breve (D minor → D major)The third movement is quick and vigorous and contains variations on many of the themes that are used in the first movement, which unites the concerto cyclically. However, after the first and second themes it diverges from the regular sonata-allegro form. There is no conventional development; that segment is replaced by a lengthy digression using the major key of the third movement’s first theme, which leads to the two themes from the first movement. After the digression, the movement recapitulation returns to the original themes, building up to a toccata climax somewhat similar but lighter than the first movement’s ossia cadenza and accompanied by the orchestra. The movement concludes with a triumphant and passionate second theme melody in D major. The piece ends with the same four-note rhythm – claimed by some to be the composer’s musical signature – as the composer’s second concerto.